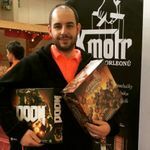 Board Games Brand Manager at ADC Blackfire Entertainment s.r.o. Author of the card game "Medvěd WRR" (www.thewrr.cz). Kids game based on the Czech book for kids.